Central prisoner in Aleppo contain more than 4600 detainees, most of them political prisoners, human rights activists and media activists, in addition to felonies’ arrest. Among the 4600 prisoners, there are at least 1300 political, media activist, or human rights activists who although finished serving arbitrary prison terms imposed by court, they remain in detention and no one get released. Prison management was committing severe torturing and humiliation methods, such as holding dozens in very tight rooms, and another torturing methods that SNHR issued different reports on. All that pushed the detainees to participate in acts of civil disobedience in July 2012. Prison management replied that disobedience with sit-firing directly on political and media activists section, led to many injuries among them. After disobedience prison management punished detainees by totally preventing visit, increased torture, and reduce food and medicine quantities. 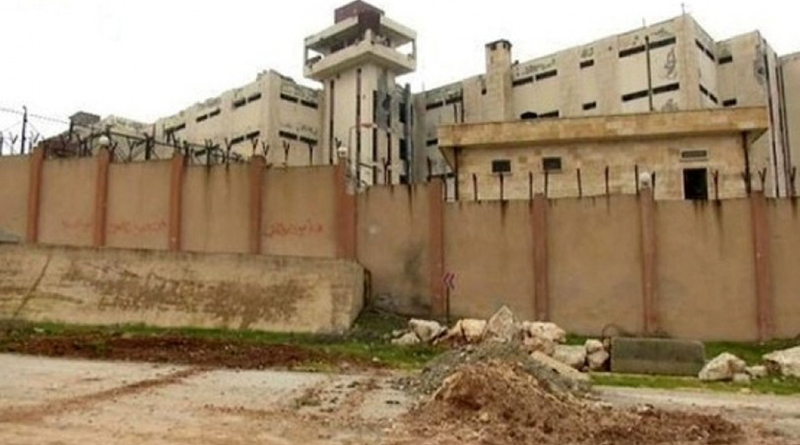 Armed rebel took a decision in 13/5/2013 of releasing all detainees in Aleppo central prison, started military operation by the name: “releasing prisoners”, and began besieging the prison and attacks it. When the detainees heard the news, they carried out Intractability inside the prison, where the security forces attacked them and fired live bullets against them, it led to kill 2 victims directly and more than 60 injuries, most of them killed later on different periods cause the lack of medicine and any treatment. Then prison troops collected detainees’ bodies, which they killed inside cells, after smelt stinky and led to spread epidemics, and buried the bodies in a cemetery known to all prisoners who testified that it’s located in the eastern yard of the prison. Large number of diseases spread inside the prison, Cause of preventing medicine which mostly was providing by prisoner’s families who visited their sons, severity of diseases were increased cause of lack of food and hygiene, SNHR estimated number of prisons infected with Tuberculosis with more than 200 infected, 7 of them dead cause lack of treatment. Poisoning condition accompanied with severe vomiting and diarrhea also appeared among prisoners, we knew that it caused by contamination of water tanks that are not cleaned or sterilized for more than 4 months and filled with plankton, dirt and worms. In addition to all of these, prison troops starved prisoners, where they give every prisoner only 150 gram of flour daily, then they reduce it to 73 grams, it led the prisoners to collect their shares together and burn the plastic covers to cook the flour, so they can eat it, but it caused suffocation cases and acute respiratory infections due to thick smoke. Monday 24/6/2013, and after agreement between Free Syrian Army and Prison Troops through ICRC in order to enter cooked food to the besieged prison, where 11 cars carrying cooked food went to the prison, but prison troops betrayed the agreement and shoot the cars, it led to injure Dr. Yaser Kaias in addition to another 5 paramedics.